Whisk together the milk, eggs and ricotta in a bowl. Gradually add the flour, whisking constantly, until a smooth batter forms. Stir in the corn, zucchini, capsicum and chives. Heat half the oil in a large non-stick frying pan. Spoon 3/4 cup quantities of the corn mixture into the pan. Cook for 3 minutes each side or until golden and cooked through. Transfer to a plate. Repeat, in 5 more batches, with the remaining oil and corn mixture, reheating the pan between batches. Serve the fritters warm or cold with a dollop of mango chutney or make a combination of sour cream and sweet chilli sauce. You'll need 2 large sweet corn cobs for this recipe. 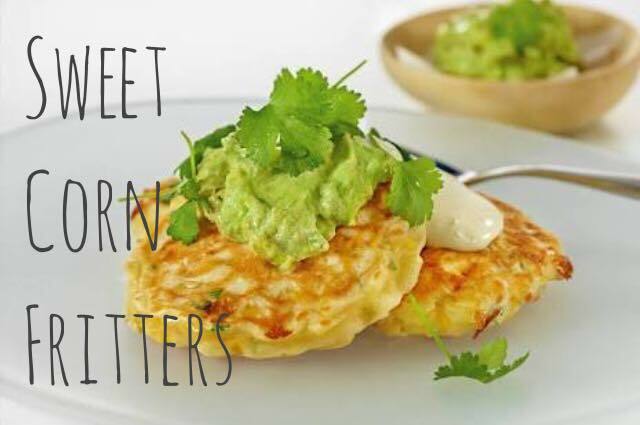 You can make smaller bite-sized fritters and top with curls of smoked salmon as a great nibble or starter.